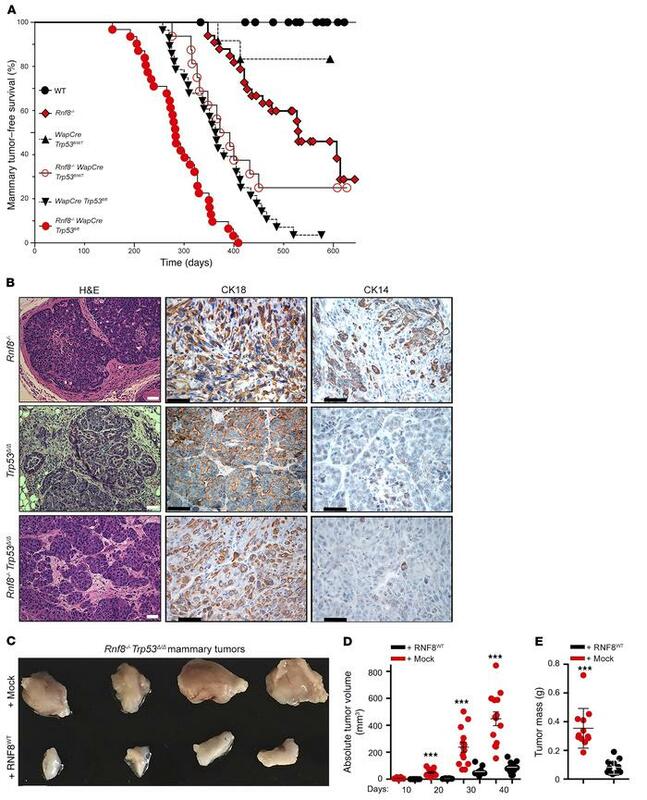 RNF8 deficiency promotes spontaneous mammary tumorigenesis in mouse models. (A) Kaplan-Meier mammary tumor-free survival curves of cohorts of WT (n = 23), Rnf8–/– (n = 33), WapCre Trp53fl/fl (n = 28), WapCre Trp53fl/WT (n = 12), Rnf8–/– WapCre Trp53fl/WT (n = 16), and Rnf8–/– WapCre Trp53fl/fl (n = 31) females. Log-rank tests indicate statistically significant differences between Rnf8–/– and WT curves (P = 0.005), Rnf8–/– and Rnf8–/– WapCre Trp53fl/fl curves (P < 0.0001), Rnf8–/– WapCre Trp53fl/fl and WapCre Trp53fl/fl curves (P < 0.0001), and Rnf8–/– WapCre Trp53fl/WT and WapCre Trp53fl/WT curves (P < 0.003). (B) Representative H&E and cytokeratin (CK18 and CK14) immunohistochemical staining of Rnf8–/–, WapCre Trp53fl/fl (Trp53Δ/Δ), and Rnf8–/– WapCre Trp53fl/fl (Rnf8–/– Trp53Δ/Δ) mammary adenocarcinomas. At least 3 tumors per genotype were examined. Scale bars: 50 μm. (C) Representative photographs of Rnf8–/– Trp53Δ/Δ mammary tumors, either mock- or RNF8-reconstituted (as indicated), 40 days after orthotopic injection of these tumor cells into inguinal fat pads of NSG mice (n = 10–12 each). (D) Dot plots showing volume of tumors (n = 10–12 each; mean ± SEM) monitored for 40 days using external caliper. ***P < 0.001, 2-way ANOVA followed by Tukey’s test. (E) Dot plots depict average mass (mean ± SEM) of tumors resected from NSG mice (n = 10–12) following 40 days of outgrowth. ***P < 0.001, 2-sided Student’s t test.